(This review may contain spoilers). When we were younger, my sister and I had a selection of videos we used to watch frequently. This was one of those. Watching the movie now, there are a lot of parts that are over-the-top. While some of the songs are quite nice, the voices and harmonising could be better. Beauty is a character it’s easy for viewers to feel sorry for. Her brothers and sisters don’t seem able to take care of themselves, coming across as shallow and self-centred. They don’t seem to really fit in with the kind of families at that time… most of them should have been married at the ages they are in the film. 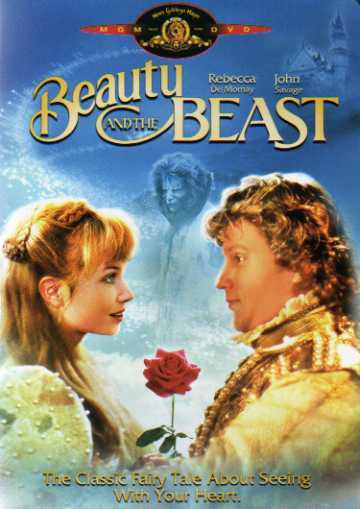 The Beast isn’t as unattractive as he could probably have been made to be, but Beauty does come across as shallow as her siblings in many ways. She’s naive and quite innocent in many ways, which does make her a likable character. While there were a couple of scenes that were really creepy to me as a child (in the rose garden especially), it is quite obviously more over the top watching as an adult. And many of the darker scenes come across as that because of the music used to create the atmosphere. There was a lot of this film that felt almost dreamlike. There were some elements of conflict, but I didn’t feel the romance was developed in the way it could have been. While there was conflict generated from Beauty, the resolution to the film (and her emotions) didn’t really come to an emotionally satisfying conclusion. The most compelling character was probably the Beast. The others seemed more cardboard cutouts and Beauty’s father didn’t seem to care enough about his children to teach them how to live their lives. The film was entertaining to watch, but could have done with being extended and the characters having more depth to them. While I enjoyed it as a child… I found it a bit disappointing as an adult. I like your review style, Cat. Very authentic :). Would love to feature your reviews in our weekly curated email digest that goes out to thousands of people. Thanks for your nice comment. I’m happy for you to feature my reviews. I have received an e-mail, thanks.